Welcome back to episode four of the Six Small Businesses You Should Know series! If you are just joining us for the first time, make sure to go back and check out the first three posts and videos in this series. 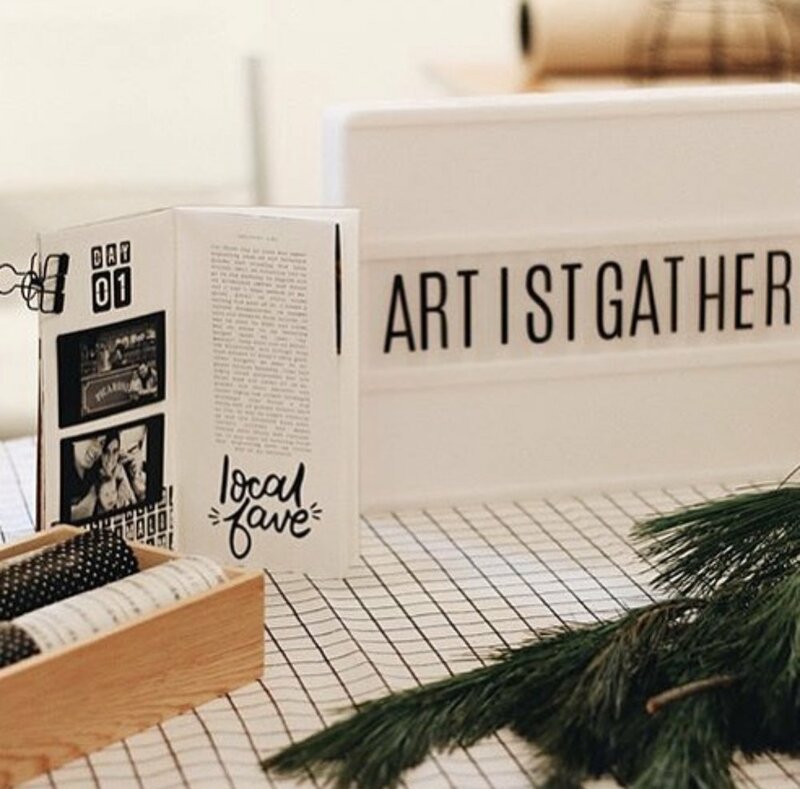 Sara Scraps and I found a few amazing small businesses at Creativation 2018 and wanted to share them with you. I just know that you are gonna love them as much as we do. Today's feature small business is a brand new company out of California called Finders Keepers. 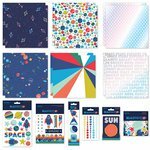 Finders Keepers has a bunch of great planner goodies including stamps and washi tape. They also have two scrapbooking lines. The one that I was most excited to see is called Libris Schmibris and is all related to reading, books, and imagination. Sara and I both fell in love with the gorgeous colors and feel of this collection. Isn't this just so beautiful?! For this particular project today, I wanted to stay consistent with the Boston traveler's notebook that I have been working on with all of the small business products so I am not going to use the literal literacy theme of this collection and instead work with some photos from The Boston Tea Party adventure that we did on our vacation. This works out perfectly with the old fashioned feel of parts of this collection and still allowed the theme to play a supporting role. Using a horizontal orientation for one of the pages of this spread worked perfectly because I really wanted to use this cut-apart card! The other side of the spread is a traditional vertical format and it worked perfectly to layer the washi tape to create a shelf for my photo strip to sit upon. The smaller cut-apart cards in the 2x2 size added a perfect addition to the outside of the page protector that I am using to hold my ephemera from the event. This allows me to add some staples as well to keep my ephemera pieces from falling to the bottom of the page protector. Each of the elements in this collection really supported the feel that I wanted to create on this particular layout. I love collections that can add a subtle element and play a strong supporting role while still allowing my photos and stories to play the leading role. I would love it if you would stop by my You Tube Channel and check out the process video where I talk more about how this project came together and I even get to show you more of the goodies from this collection. Don't forget to visit Sara Scraps and her project for this collection as well. You will definitely want to leave us both comments here on our blogs as well as on You Tube so that you can be entered into the giveaway at the end of this series for a whole box of goodies representing each of the six companies that we feature. Welcome back to the third small business feature in the Six Small Businesses You Should Know series. Sara Scraps and I are focusing on six small businesses that we recently found or worked with at Creativation that we were impressed with and thought that you would like to see as well! This week, we are talking about Catherine Pooler Designs. This particular company makes premium dye ink pads as well as unique stamp sets and also sells some other accessories and goodies. We both had an amazing time talking with the team for this product line at Creativation and I was really impressed with the pattern builder stamps like the one I am using today. 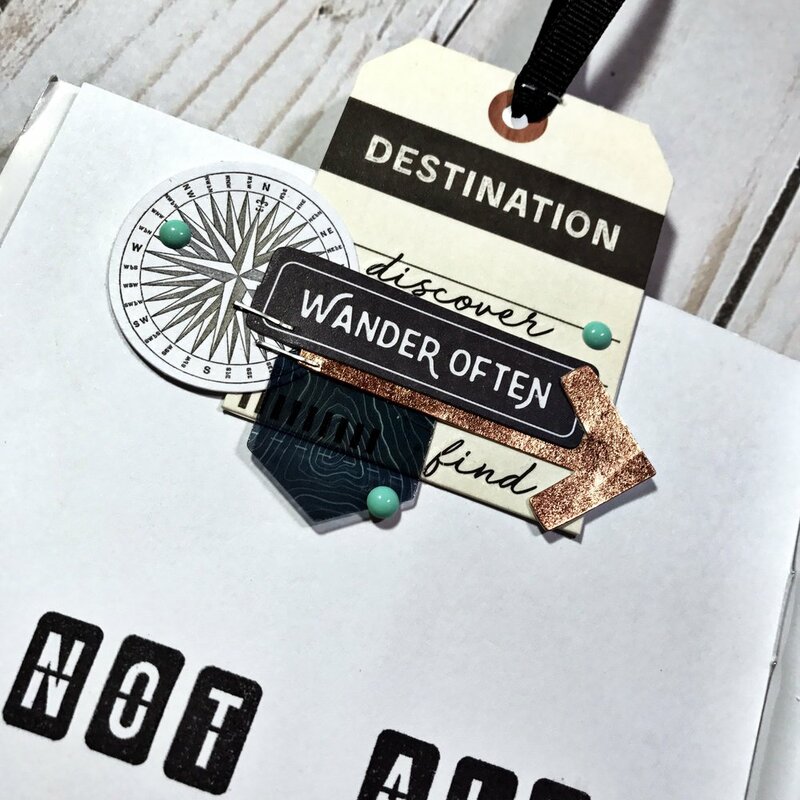 I love when I can find a company that makes products that will work for both card making and scrapbooking since I love to stamp in my memory books as well. For my project today, I am working in my pocket notebook from The Stamp Spot where I am creating a travel memory book for a trip that we took as a family to Boston last summer. (Make sure to go back to the other episodes in this series if you want to see more about the other pages and projects!) I started out knowing that I wanted to create a unique border on the side of my layout and so I used one of the stamps in this pattern builder set and then fussy cut the edge to create something a little more unique and different since the edging won't be a square anymore. Then, I went ahead and added some embellishments from the Crate Paper Here + There collection which is what I am trying to keep consistent throughout this project. I added some stamping to my title using the Artist Gather stamps and the Aquatini Catherine Pooler dye ink. Do take a minute and leave a comment below as well as on the YT video so that you can get some entries into that amazing prize pack that we are going to have at the end of this series. (*Hint...Hint...one of these amazing, vibrant ink pads is in that prize pack!) Also, stop by and visit Sara Scraps blog and YT channel to check out her project with our highlight on Catherine Pooler Designs. Come back again and see us on the 1st as we highlight small business number four. Welcome to the second of six episodes where Sara Scraps and I are going to be sharing Six Small Businesses That You Should Know! We are super excited to be showcasing a new small business on the 1st, 10th, and 20th, of the month for the next couple of months. The best news is that we are going to be giving away an amazing prize pack at end of the six episodes full of goodies from all six companies. Please know that we are not in any way, shape, or form affiliated by or paid for content by these companies! We just really love them and think that you will too!! For today's project, I wanted to continue working in my traveler's notebook project for a family trip that we took last summer to Boston. Make sure to go back to the first episode in the six small businesses series if you want to check out the couple of things I completed in this project. For today, I knew that I wanted a way to be able to document the best parts of this city for each member of our family. Rather than use up five separate spreads, I decided to create some tags to use in my first pocket page of the insert. *This is what makes Michelle's products SO unique and fuN! There is one tag for each of the five members of the family to write about their favorite parts, best memories, or things they loved about Boston. I completed mine already and will have my family finish theirs this weekend. I wanted to play around with the idea of creating a shaker pocket on the bottom portion of the pocket page that I could use to add a little interest and sparkle. I filled up that bottom section with cork mini stars and an amazing sequin mix called Authentic You from SpiegelMom Scraps (*another super amazing small business). I also put a small piece of acetate inside that had a rub on of a globe. This was my first time trying to use rub-ons on acetate and let's just say that now I'm hooked! It worked like a charm and the transparent quality is just stunning and unique. I sealed up that little pocket using my fuse tool and added a couple of sticker details right on top of the plastic pocket! I added my handmade tags to the top portion of the pocket and that completed the look! I am SO super excited about how this project is coming together so far. I just love the colors, unique little touches, and feel of the project so far and I just can't wait to keep going. Make sure to also hop on over to You Tube to check out the process video where I share a lot more details about how this project came together as well as how I created by handmade tags. Do take a minute and leave a comment below as well as on the YT video so that you can get some entries into that amazing prize pack that we are going to have at the end of this series. (*Hint...Hint...one of these pocket notebook inserts is in that prize pack!) Also, stop by and visit Sara Scraps blog and YT channel to check out her project with our highlight on The Stamp Spot. Come back again and see us on the 10th as we highlight small business number three. Coming Soon......A New Series and A Fantastic Giveaway!! Have you ever happened to find a set of products that just made you smile? Do you go out into the world searching for those small, family owns businesses that offer a personal touch, amazing customer service, and something unique? Well…Sara and I got to talking about some of our favorite small business (some new and some established) and had the same feeling of wanting to shout from the rooftops how amazing they are! So…on the 1st, 10th, and 20th of the month for the next couple of months, we decided to start a new series called Six Small Businesses That You Should Know so that we can highlight them and shout from the rooftops how much we love them! Each week, Sara and I will both post a blog post as well as a process video working with products from the focus business of that episode.